This is old version Iron Knights 1.6.1 apk for Android, you can install it if you want to downgrade or install old app. It is top Action apps from Eyedentity Mobile. After solving quest, you get more than thousand random items depend on quest difficulty. One character is for one player, but additional ones can be put to accompany main character, though player does not have fully control of them. Total amount of characters on this game are approximately more than two hundreds. When you pass one stage then move to another level, your character ability will be enhanced with item from previous session. Free version of this game still has limited accessibility to items and treasure. Therefore, you are recommended to buy full version. You can pick several modes on this game. Playing alone is different from multiplayer through internet. Having friend to clear stage is very important because player will go to boss level quickly. The most attractive on this game is graphic which incorporate high definition resolutions to make screen look very visible. You want something exciting? 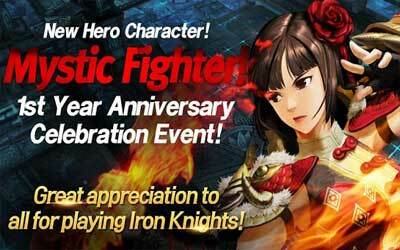 Iron Knights for Android will be good choice to play. Strategically Action-play through Strength & Weakness of the Elements! Guild System : Show Other Knights the Power of Your Guild! Fortress of Chaos : Challenge Limitation of Your Hero & Units! Several Types of Modes to Challenge your Hero and Units!